Magistrate Anthony Vella (left) and Magistrate Consuelo Scerri Herrera. 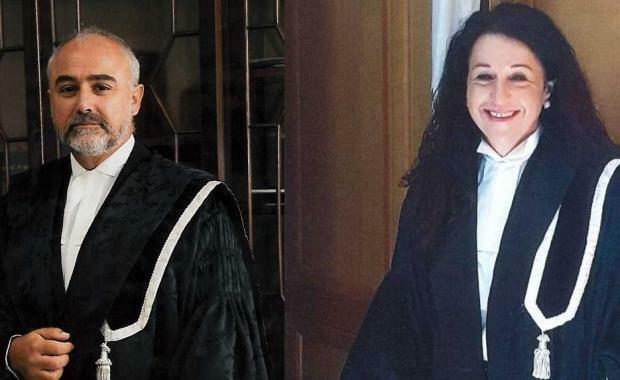 The magistrate leading the inquiry into the murder of Daphne Caruana Galizia will be promoted to judge on Monday, along with another magistrate who last year was seen as being found her unfit for the role. The Ministry of Justice on Sunday formally announced the promotion of Magistrate Anthony Vella, meaning that he will have to hand the inquiry to somebody else. The promotion, which was widely expected, has already raised concerns because of delays it may cause to the inquiry. Also set for promotion on Monday is Magistrate Consuelo Scerri Herrera, following in the footsteps of her late father, who was also a judge. In January, The Sunday Times of Malta reported that Magistrate Scerri Herrera has been rejected for the position of judge by the Judicial Appointments Committee. The committee found her unfit for the role, not over matters of competence but over her conduct in her private life. She was subsequently re-nominated for the post. Also being promoted judge is Magistrate Grazio Mercieca, who was made a Magistrate in November 2016. Dr Mercieca, 61, served for many years as president of Labour’s Gozo section. In 2013, he was appointed chief adviser to the then Gozo Minister. Three lawyers are to become magistrates - Dr Rachel Montebello, Dr Simone Grech and Dr Astrid May Grima. The appointments mean that women will be in the majority for the first time – 23 women to 22 men.